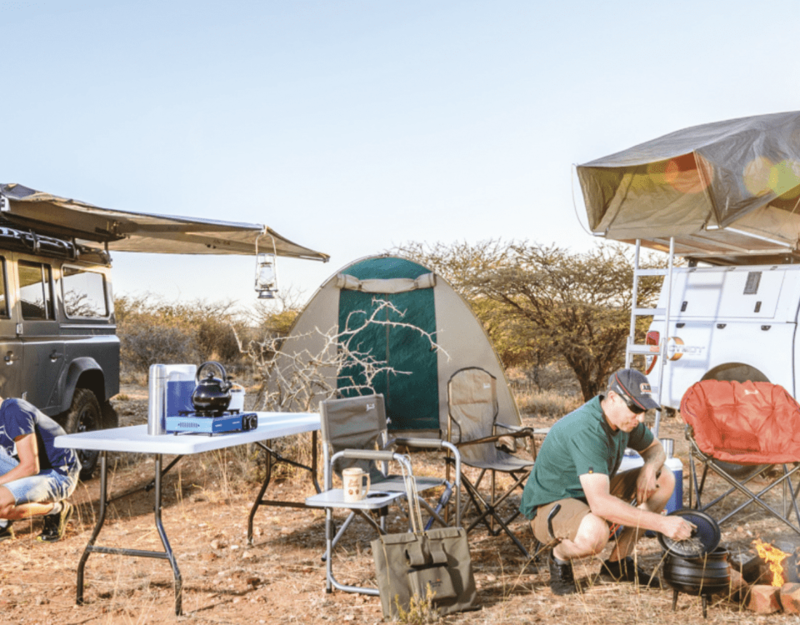 Despite Namibia’s designation as the driest country south of the Sahara, it boasts an impressive feat: It is endowed with a rich bio-diversity, including more than 690 rare and endemic or near-endemic species. Of these endemic species, several include indigenous natural plant products (INP’s) , many of which are endowed with useful properties, including medicinal, health and nutritional benefits. 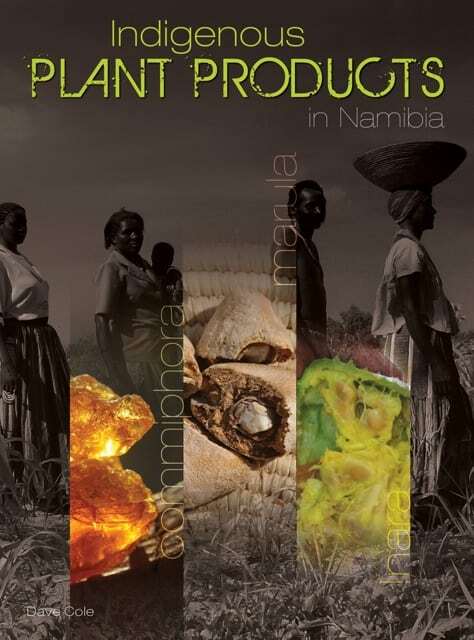 A first for Namibia: Indigenous Plant Products in Namibia book cover. Now, for the first time, a book has been launched which takes an in-depth look at some of these indigenous natural plant species, their useful properties, their cultural uses and their commercial value, amongst other things. Yesterday saw the launch of the ‘Indigenous Plants Products in Namibia’ book, a project funded by the Millennium Challenge Account Namibia (MCA-Namibia) programme, which takes a look at the work done by the Namibian government, the MCA Namibia programme indigenous plant task team and other NGO’s, over the past few years in the indigenous plant products field with the aim of improving the benefits to local rural communities and boosting the knowledge and awareness of INPs. The project received funding of more than N$7 million from the MCA-Namibia project according to Liz Fileke, the Deputy Resident Country Director for Namibia from the Millennium Challenge Corporation (MCC). Fileke pointed out that the project has a significant advantage, in that the majority of beneficiaries consisted of Namibian women. Overall, more than 35 000 Namibians benefited from the project, she stated. Fileke described the book as the “icing on the cake” of the INP MCA-Namibia activity, a positive conclusion to a successful project. 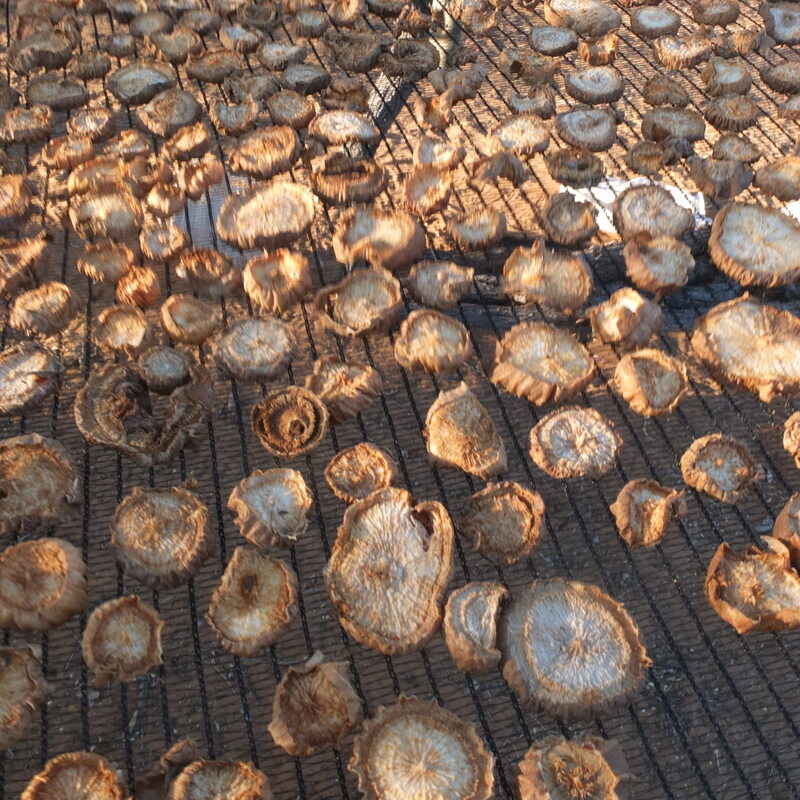 Devil’s claw: cut into discs and put on a rack to dry in the hot Namibian sun. The launch was attended by MCA-Namibia’s Chief Executive Officer Penny Akwenye, Joseph Iita, Permanent Secretary at the Ministry of Agriculture, Water and Forestry and Liz Fileke. Akwenye explained that INPs play an important role within rural communities and as such, one of the goals of the MCA Namibia programme was to “increase economic opportunities for primary producers by increasing volumes of products and processed and / or by adding more value to products in Namibia”. 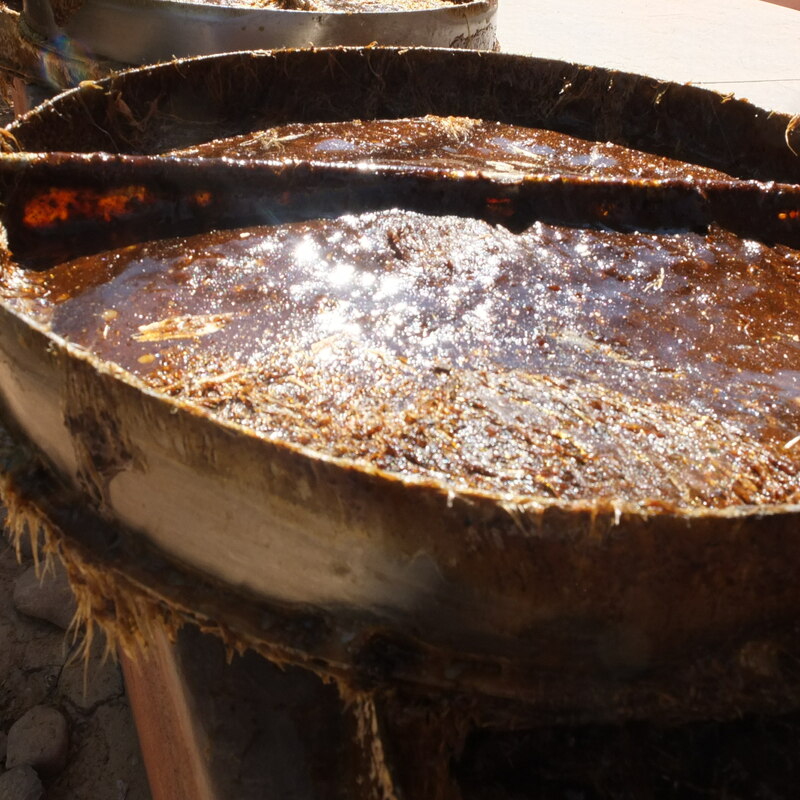 Processing commiphora to extract the oils. Akwenye noted that many women and men living in the “harsh and already marginal agro-environment” of Namibia are dependent on INPs for their livelihoods “and the challenge is to support them to sustainably benefit from that resource”. One significant aspect of the support to producers of indigenous plant products, is that most of them are women, who face difficult challenges within the rural environments in which they raise their families and eke out a living from their surroundings. As such, the INP Activity within the MCA Namibia programme directly supported more than 9 200 community members involved in indigenous plant products, the majority of whom are rural women. These individuals received training in quality control, resource management, business management and contract negotiation. More than 5 200 people received specialized training in the sustainable harvesting techniques of Devil’s Claw, amongst other training opportunities. 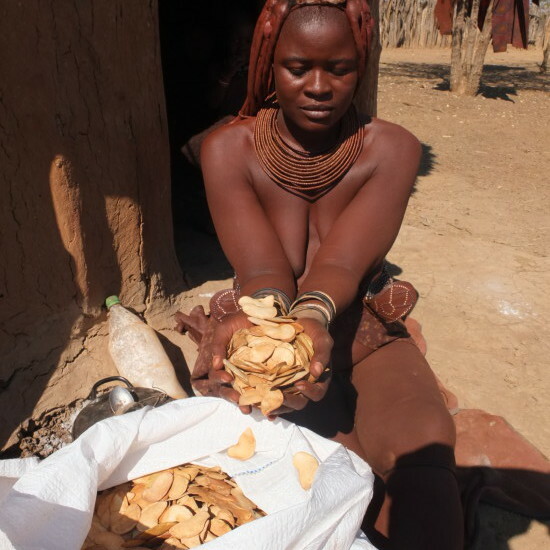 Kaveura Muhenje – Mopane seed harvester in the Kunene region. These achievements, plus the accumulation of scientific information regarding indigenous plant products, form part of the content of the newly launched book, funded by MCA Namibia through its INP Activity. Akwenye explained that the book targets a myriad of people, including researchers, government officials, service providers and the general public at large. The Permanent Secretary, Joseph Iita, told the audience at the launch that “Namibians have built up a substantial body of traditional knowledge and associated use of local plant resources. It is this knowledge and the increasing global trend towards natural products that have made the commercialization of INPs in Namibia possible – and a success”. 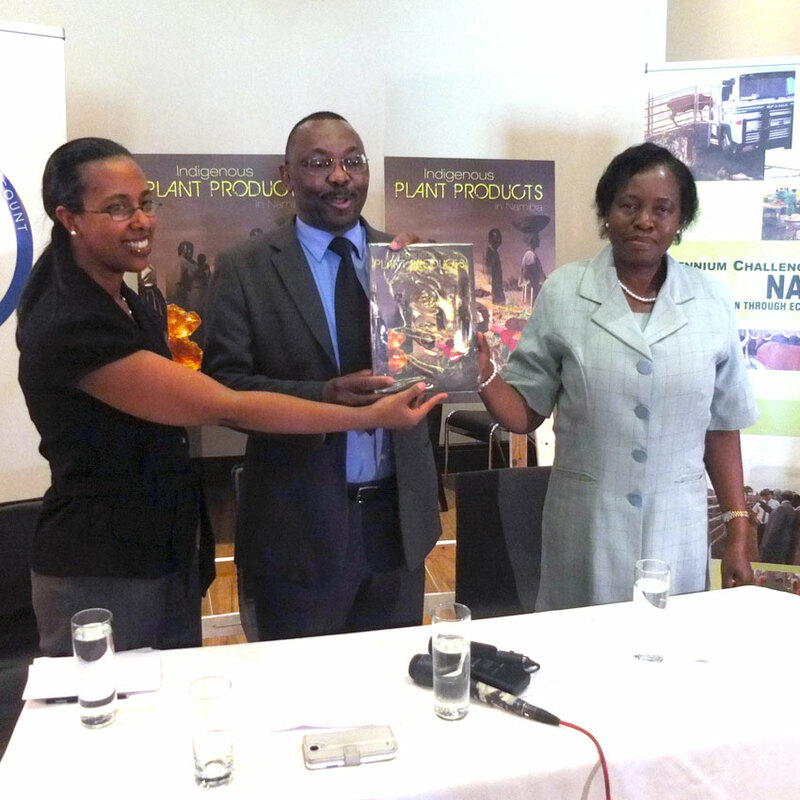 Liz Fileke, the Deputy Resident Country Director for Namibia from the Millennium Challenge Corporation (MCC), Joseph Iita, Permanent Secretary at the Ministry of Agriculture, Water and Forestry and MCA-Namibia’s Chief Executive Officer Penny Akwenye officially launch the book. Iita noted that many indigenous plants “are more suited to the environmental conditions (of harsh and drought-prone Namibian landscapes) than conventional agricultural crops”. As such, it is a natural step to commercialise INPs “since it allows for the diversification of income-generating opportunities for rural Namibians, encourages better use of these resources and makes a positive contribution to farming systems and household security …”. Iita concluded that Namibia’s government remains committed to providing resources and working together with other partners “to develop an economically thriving and internationally renowned INP sector in Namibia”. Demasius Publications is a marketing and distribution agent and we would like to enquire if we can sell the book? to whom to we speak? have you got a wholesale price for us? Dear Rudy, we will happily send you a copy for free if you wouldn’t mind paying for the mail or courier costs to Belgium. Please contact Bonn at bonn@venture.com.na with your request.